LED phototherapy is an amazing technology invented by NASA scientist. It is completely non-invasive, plus there is no downtime or irritation after receiving a treatment. It works great on aging and acne skin as well. It will leave you with nothing but, glowing beautiful skin. LED Light Therapy is gaining public awareness at a rapid rate. Not only is it non-invasive and natural, it is recognized as one of the safest, fastest and most affordable ways to achieve younger, healthy skin. Used in conjunction with treatments and peels, LED Light therapy dramatically reduces pigmentation; stimulate collagen and elastin while tightening and toning the skin. In addition, increased blood circulation accelerates healing, minimizes pore size and kills P. acne bacteria. 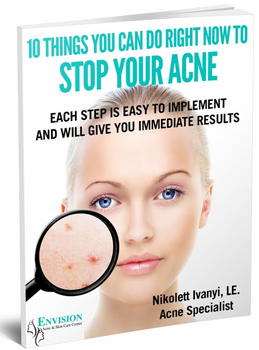 Also great to reduce acne scarring. 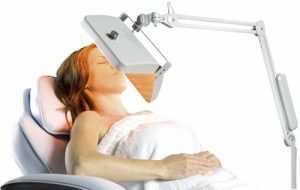 LED light therapy is a non-invasive treatment that is widely used by dermatologist and skincare professionals because of its results. How it works: Red and infrared light penetrate the skin and once absorbed, the cells in the human body, use it and convert it into ATP, this is the fuel that powers life on a cellular level. This newly converted cellular energy, stimulates the body’s natural processes, increasing blood flow, allowing the body to receive oxygen and nutrients they need in order to function more effectively. The results for you are anti-aging, accelerated healing of acne and pain relief. Red and infrared wavelengths stimulate the production of collagen and elastin, the building blocks of your skin. The benefits are reduced wrinkles, shrinking pores, diminishing scars, accelerating healing and aiding with injuries. A person undergoing light therapy will experience deep relaxation, increased oxygenation and hydration of the tissues. It expells toxins from the body, alleviates inflammatory conditions, improves the appearance of the skin, making it plumper, firmer and more youthful. Light therapy is a very interesting form of healing your skin and bringing it back to life. And if you are young, the best time to start, it will keep your skin youthful and glowing. Make an appointment and let’s get started!